Wooden decks are significant investments that add value to your home. It is for this reason that proper care and maintenance of the deck should be done to make it look better and even extend its life. The deck is usually exposed to harsh elements like the sun, rain, snow as well as dirt and debris. This makes it weak and changes its color to grey. Using a pressure washer to clean your deck can help you remove dirt and grime quickly and help restore its original look. Apart from using water more efficiently, pressure washing a wooden deck will save you the work of manual scrubbing, which can be tedious. However, it can be a daunting task to select the right washer for your wooden deck. This is because the wrong machine could blast your deck. 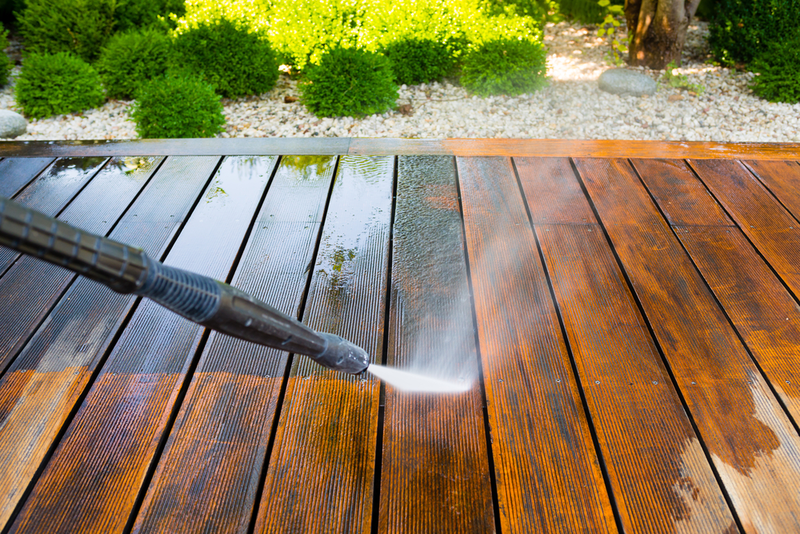 Here is a guide to help you when selecting a pressure washer for deck cleaning. 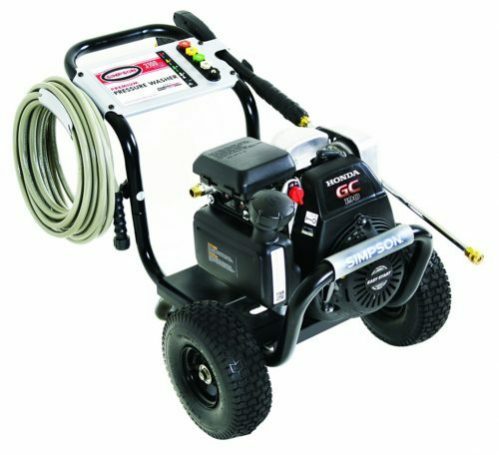 Electric or Gasoline Pressure Washer? 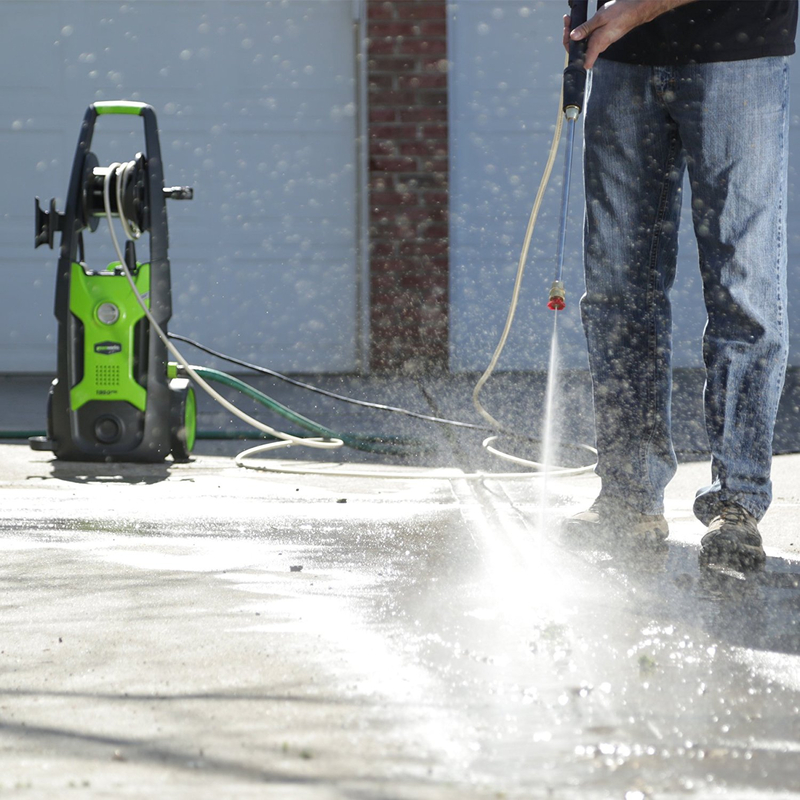 The type of pressure washer you choose will depend on what you are planning to clean. Ideal Pressure Washer indicates that electric power washers are best for cleaning small decks as they usually provide between 1000-2000 PSI. 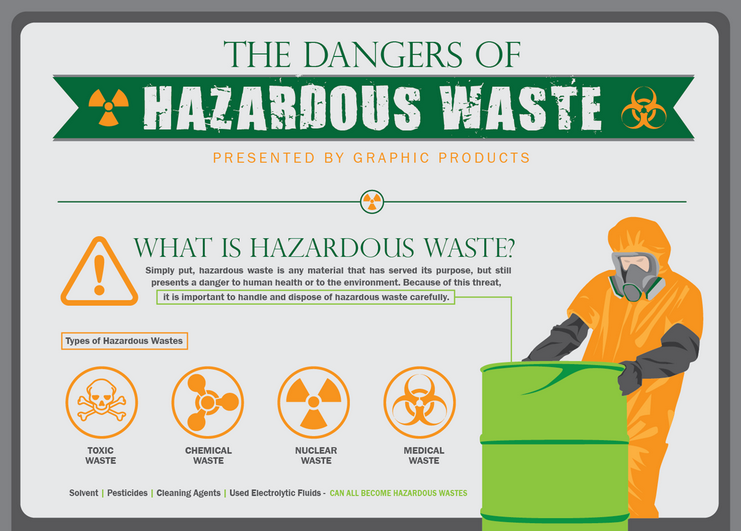 They are also quieter, lightweight, and compact, as well as require little maintenance. Gasoline pressure washers, on the other hand, can blast away stubborn dirt on large decks and other areas. 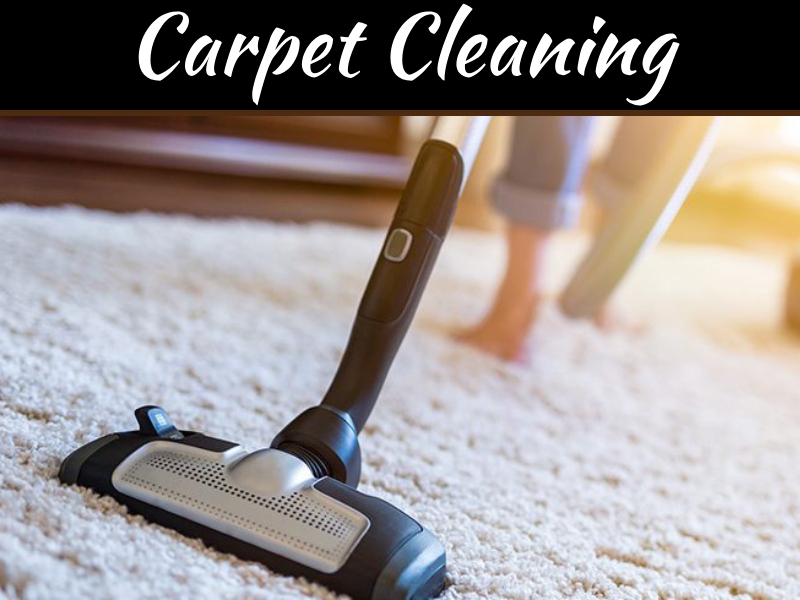 This model is best for you if you are looking to clean more quickly and frequently. One of the most important things to keep in mind when choosing a pressure washer for your deck is the pressure (PSI) and flow rate (GPM), which constitute to the overall cleaning power of the machine. Different types and sizes of washers have different PSI and GPM. Note that the higher the PSI and GPM, the more power the machine has to tackle heavy jobs and stubborn stains. When it comes to deck washing, less pressure is recommendable; otherwise, your wood can be damaged. Hence, if you have soft wood, go for a washer with 500 PSI to 600 PSI and 1200-1500 PSI for harder woods. Also, it is recommendable to use cold water power washers that fall in the range of 1500-1800 PSI. This is because hot water pressure washer is likely to raise the grain. 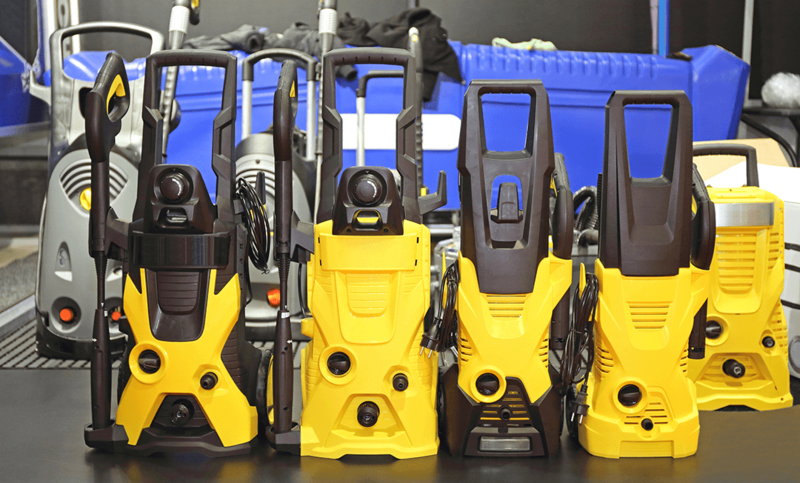 Different pressure washers come with different nozzle tips that you can choose from. The 25-degree nozzle tip is the best choice for heavy-duty deck washing. The 40-degree tip can also be used since it is made for light cleaning jobs. However, do not use the rotating brush with this tip; otherwise, it will lift the wood fiber, thus creating a rough surface. 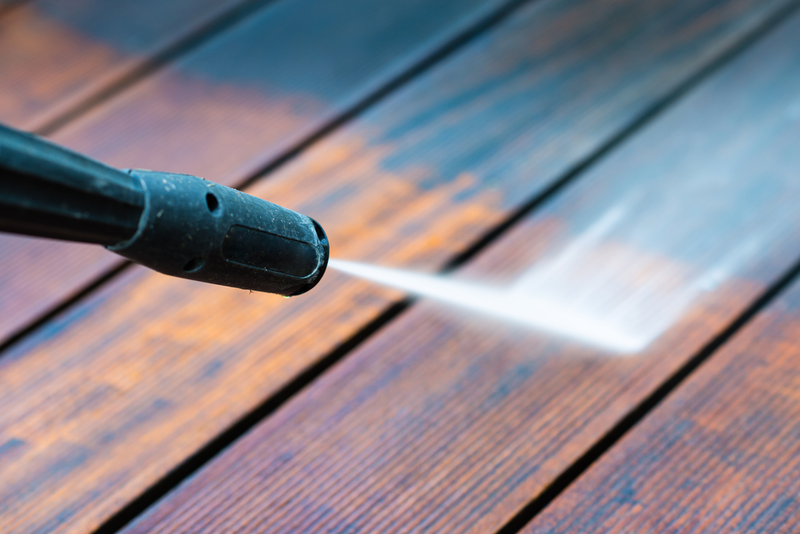 The 0-degree tip is not recommendable for deck cleaning since it produces a concentrated spray pattern that is likely to scar or damage the wood. The 15-degree tip is best for tough cleaning jobs like washing concrete, driveways, and patio. Note, always keep the wand in motion while still spraying to prevent damaging the wood deck. For effective and quick cleaning of your deck, invest in a pressure washer that has the right tools and accessories. Pressure washers that come with a soap tank are a good choice since you won’t need to use separate containers. The right brush will make a difference, as well as leave your deck cleaning project sparkling. Wondering what the best pressure washer for decks is? 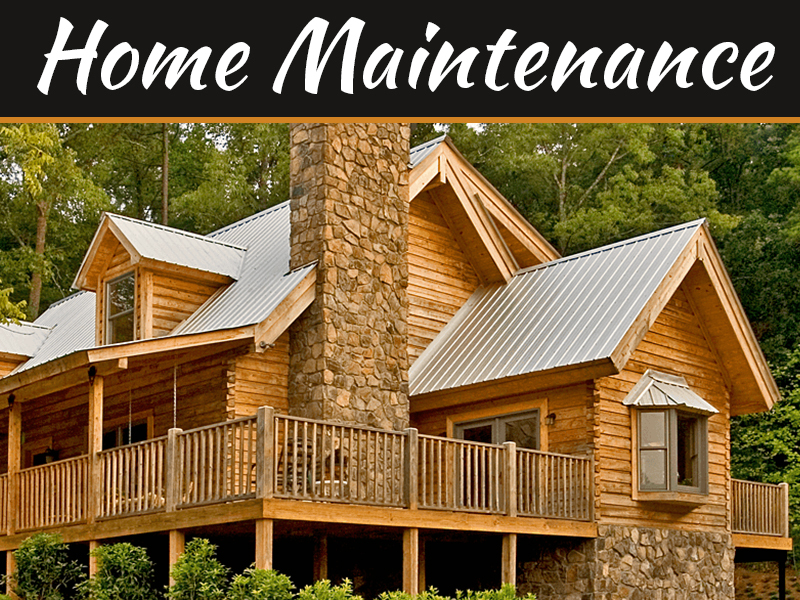 Well, here are some models that can get your wooden deck sparkling. The AR Blue Clean AR390SS is the best electric pressure washer with 2000 PSI at 1.4 GPM cleaning power. This will quickly blast away debris and dirt from your deck. With a tri-axial pump and 14-amp universal motor, its cleaning power is unmatched. This unit is built with quality and comes with a 30-ft high-pressure hose, as well as a hose reel. The AR390SS is also designed with four different pressure washer nozzles that are quick to connect and use — not forgetting the 35-foot power cord and 48 oz detergent tank that will make cleaning easy and convenient. This is the perfect solution if you are a looking for a powerful yet affordable gasoline power washer for deck cleaning. 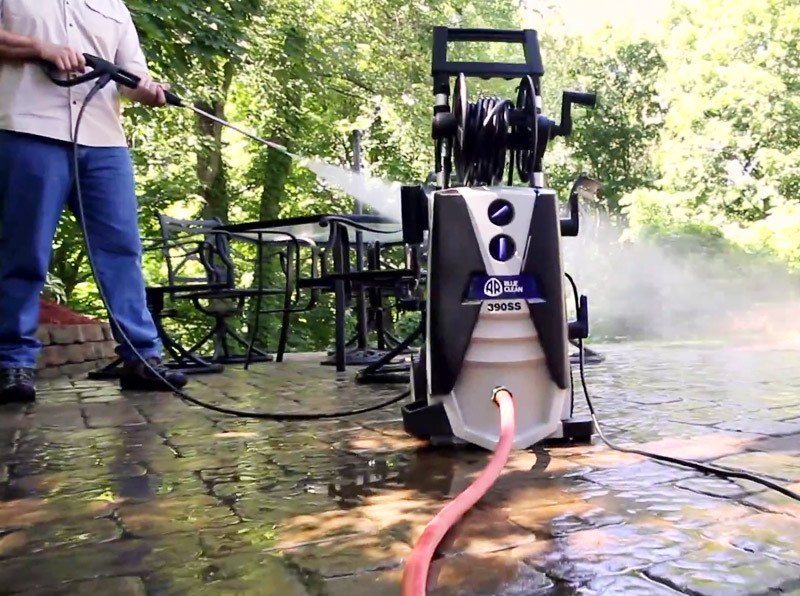 At 3200 PSI at 2.5 GPM, this power washer has the ultimate cleaning power to get rid of tough dirt and debris quickly. With its Honda engine, you can be guaranteed an optimal performance with minimal effort. This unit comes with five quick-to-connect nozzle tips that you can choose from, including 0-degree, 15-degree, 25-degree, 40-degree, and soap applicator nozzle. Moreover, it comes with a 25-foot kink and abrasion resistant hose, maintenance-free axial cam pump, and ergonomic spray gun. This motor-powered unit is one of the best Greenworks pressure washers in the market. This machine is not only affordable but also comes with a 1950 PSI at 1.2 GPM for effective cleaning. The GW1951 has a long sturdy frame with wheels fitted on the sides for mobility. 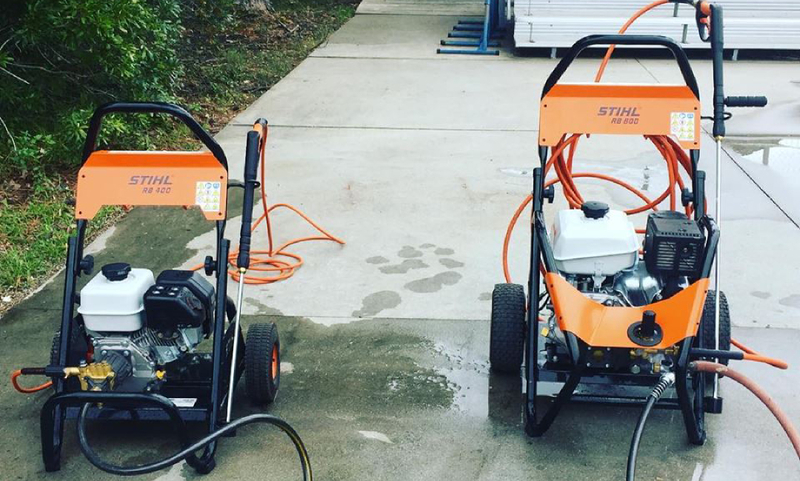 It is one of the best performing pressure washers since it has a motor rated at 13-amp. 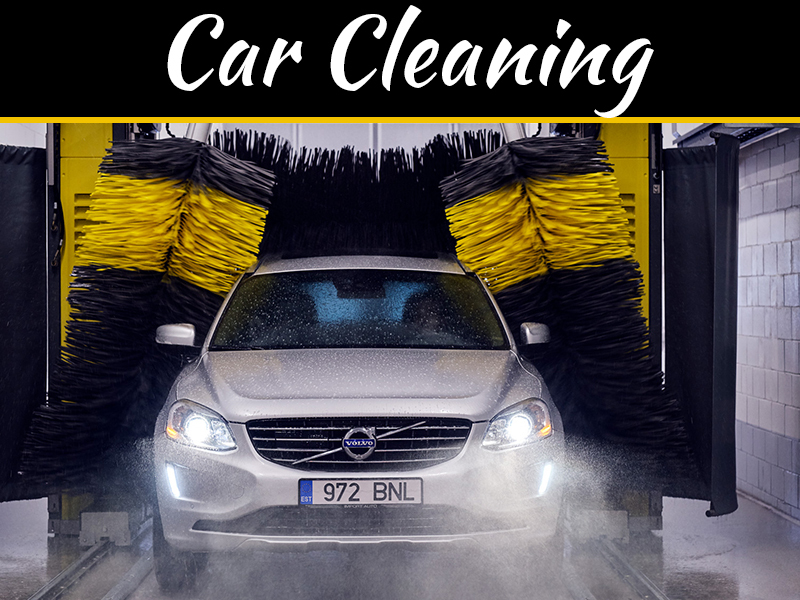 It is the best pressure washer for cars and other home cleaning tasks. Deck washing is a quick and effective way of caring for your deck against dirt, mold, and gray. The key to a successful deck power washing is using the right type of pressure washer with the correct PSI and GPM, as well as nozzle tips. This way, you will do an excellent job with minimal damage.